This ritual set honors the Oracle; she who is most connected to Apollo, and channels the wisdom of the gods for the Higher Good. The Oracle Pythia was a priestess with utmost authority on matters ranging from the political to the spiritual, and unlike her civilian sisters, she was awarded many freedoms in society. Allow this ritual set to honor your own divine intuition, whether it is to aid and counsel your friends in need, or to honor your own sacred knowing. One clear quartz faceted sphere. This sphere is so beautiful and magical. It is faceted and resembles a disco ball, but don’t let its whimsy deter you; this is a powerful piece of healing magic. Clear quartz resonates at a high frequency, encourages positive energy, and the balancing of all chakras. Use it to magnify the power of your intentions, and to purify, clear, and cleanse your aura. Meditate with this to aid your divinations, and heal your emotions. One Oracle candle. This rolled candle will literally light your way as you use it to facilitate spirit communications, honor fire energies, or add relaxing light to your ritual. 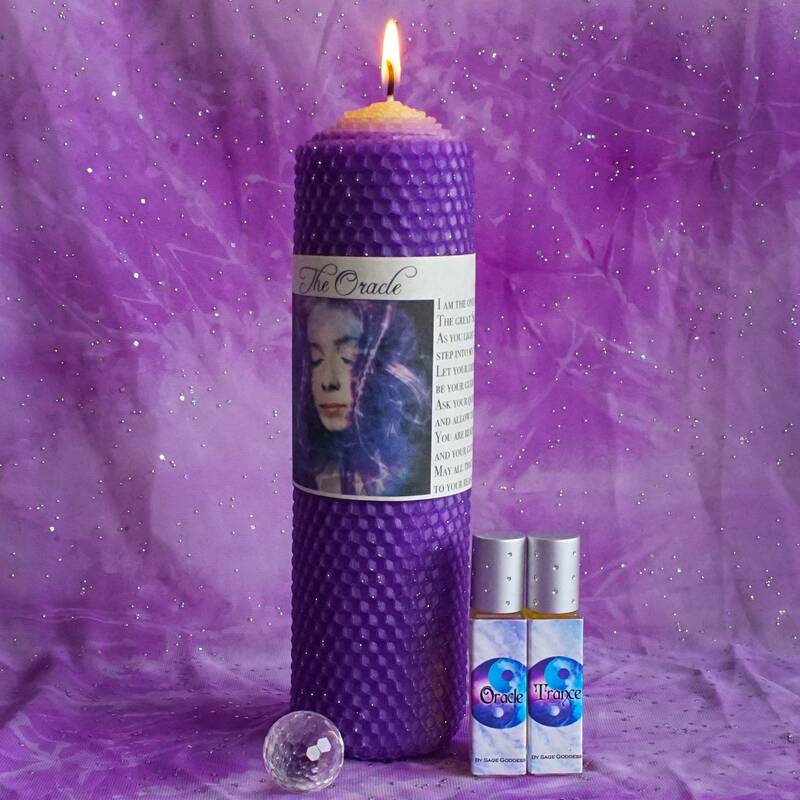 It is crafted with beautiful royal purple beeswax, rolled with pieces of clear quartz, and anointed with my Oracle perfume, which you will read about below. A rectangular roll on bottle of Trance, a blend I’ve created just for this set. This one is sweet-smelling and has notes of apricot and flowers. A moonstone placed in the bottle honors the high priestess, aids your intuition, and calms your inward journey. And lastly, Oracle, which comes in a rectangular roll on. Oracle is a sharper, fresh scent with notes of patchouli and musk. A clear quartz placed in the bottle both purifies and protects. Use the two blends together to get you to the enlightened state you desire. May the items in this ritual set facilitate trust and connection with your intuitive powers; may it guide and sanction your ceremony, and fill your space with white light and healing wisdom from Spirit. I am offering you the option to purchase either the candle or perfume duo on their own, or to purchase the entire set which comes with the clear quartz faceted sphere. Choose the tools that call to you from the drop down menu. Your items will arrive to you parceled in beautiful gift-wrapping. This set is amazing – the perfumes smell wonderful but are so much better when used together!